Hello and happy Wednesday! I have to apologize for my lack of posts lately. February was just a bit too full for my liking, I’m looking forward to a quieter March. I have a special announcement today, I was asked to be a Creative Crew Member for the next UStamp with Dawn and friends event. It’s called Big Shot Brilliance, projects to die for. I am so excited about this event, there are going to be so many great projects. If you’re interested in signing up click on the banner below. The project I have for you today is one we made in my Big Shot Club a week or so ago. 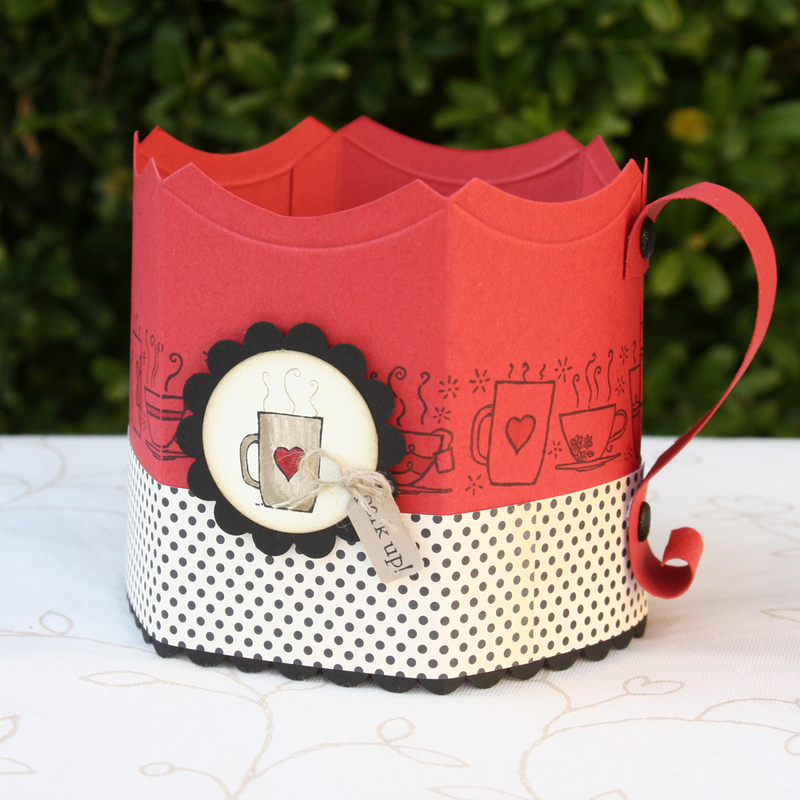 It’s a fun coffee mug made using the Pillow Box Die. 1.) Cut 3 Pillow Boxes. 2.) Choose one side to be the bottom of your mug and trim off all tabs. 3.) On the top edge of the mug, trim off the three rounded Pillow box tabs so that all edges are the same. 4.) Attach the 3 Pillow Boxes together and keep flat. 5.) After stamping and adding the dsp, attach the ends of the mug to create a cylinder. 6.) Cut 3 strips of cardstock to 1 x 5 and score at 1/2 and 4-1/2. 7.) Attach these in a crisscross fashion in the bottom of the mug. 8.) Attach a circle cut from the Clear Circle Die to the top and bottom of the strips. 9.) Cut a strip of cardstock to 7/8 x 5, curl and attach to the side of the mug, creating a handle. All supplies can be purchased on my website.